The spiritual, ritualistic and devotional superstructure of India is a glittering multiplicity of faiths, icons, systems and ways of living. The Bhakti cult is one supersystem which geminated perhaps around the 5th century A.C. and made its most voluminous contributions between the 15th and 18th centuries A.D. The cult was concretised by the great Bhaktas – best known being names like Meerabai, Kabirdas, Surdas and Tulsidas-all saint singers, who spoke and sang the language of the common folk-extolling the virtues of good thoughts, good deeds and an existence of simplicity, honest work and devotion to one Supreme Lord. Thus the Bhakti cult was a movement against the tyranny of ritualism, casteism, untouchability and other aberrations which had crept into formal religious practices. The songs of these innumerable great savants-ranging from the Alvars and Nayanars of the South to the Gurus of Punjab, from Meera and Narsi Mehta in the West through the saint poets of the Braj region like Sur and Tulsi to the Vaishnavite mendicants of the East-have come to be generically called Bhajans in today’s musical milieu. They have grown to become a beautiful body of devotional literature in India, serving a purpose different from the esoteric Vedic chants, mantras, stotras and stutis, or the great philosophical scriptures and epics of this land. 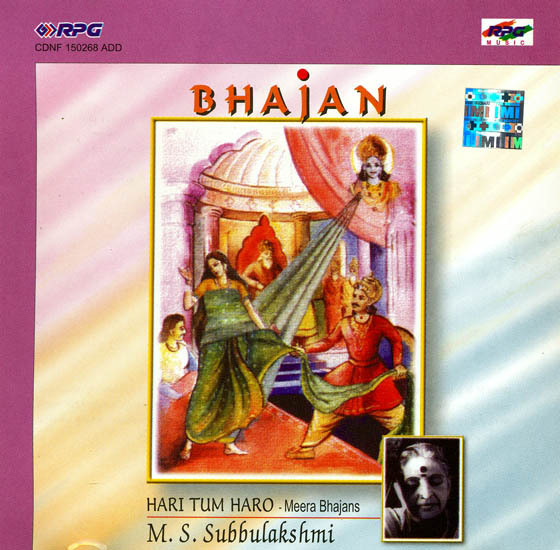 This ‘BHAJAN’ series of HMV brings the immortal words of the Bhakti movement of India through many memorable voices of contemporary music like D.V. Paluskar, Kishore Amonkar, Bhimsen Joshi, M.S. Subbulakshmi, Pandit Jasraj, Girija Devi, Kumar Gandharva, Lata Mangeshkar, Sandhya Mukherjee and others. When M.S. Subbulakshmi’s film classic Meera was released in the early forties, she was immediately established as the modern day Meera. Such was the combination of the magnificence of voice, the stunning beauty of her visage and the pure divinity of her being which radiated from the music in herself. Her Meera bhajans are among the most sought after songs on the Indian performing arts stage.